On the Week 8 edition of the Subway Friday Fresh Take, we’ll recap some of the state’s top games featuring ranked opponents and highlight a few other notes from Friday’s action. 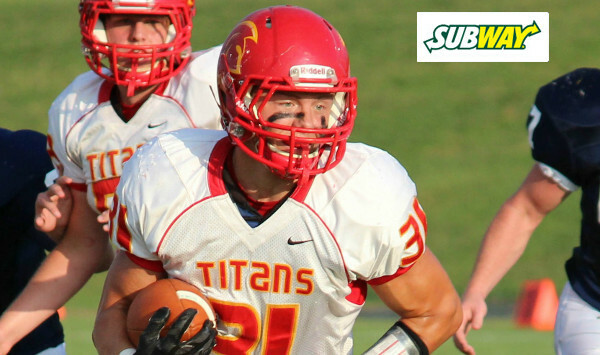 Remember, next time you visit Subway, please thank them for sponsoring Kansas High School Football with Kpreps.com. Alan Clothier hit Luke Padia on a 26-yard touchdown pass with four seconds left to lift top-ranked Lawrence to a 31-28 win over Olathe North. But for most of Friday’s game, it didn’t appear any late-game heroics would be needed. Lawrence cashed in a pair of Olathe North turnovers to race out to a 17-0 lead in the first quarter. The Lions lead was 24-7 mid-way through the fourth quarter when the Eagles began to rally. Quarterback Matthew Wright hit Isaiah Simmons on a 7-yard touchdown pass to pull the Eagles within 24-14 with 5:13 remaining in the game. Almost three minutes later, Wright and Simmons hooked up again – this time on a 60-yard touchdown strike to pull Olathe North within 24-21 with 2:20 left. Lawrence was unable to pick up a first down and run out the clock. After Lion punt, Olathe North took over at the 35-yard line with 1:18 remaining and no timeouts. The Eagles went right to the air and Wright hit Simmons on a 35-yard jump-ball in the end zone to give Olathe North an improbable 28-24 lead with 1:02 remaining on the clock. The Eagles had scored 21 points in a matter of four minutes, all via the Wright to Simmons connection. First, Clothier hit J’Mony Bryant on a pass for 38 yards to the Olathe North 28-yard line with 30 seconds remaining. Three incompletions later, Lawrence faced fourth down with 12 seconds left. Clothier lofted a fade to the left corner of the end zone and Padia pulled down the ball in the corner for the winning touchdown. Both of Padia’s catches went for touchdowns covering 84 yards. Clothier threw for 148 yards and those two scores, while standout running back J.D. Woods threw a 20-yard halfback pass for a touchdown to Ivan Hollins in the first quarter. Woods finished with 92 rushing yards on 23 carries. Clothier rushed for 58 yards and a score. Simmons caught five passes for 120 yards and three touchdowns for Olathe North. Wright passed for 169 yards and those three scores, and added 93 yards on the ground. Olathe North was led by Vinnie Shabazz’s 126 rushing yards and a touchdown. In a match-up of a pair of unbeaten teams in Class 3A, Halstead fullback Layke Heimerman scored on a 4-yard run with 1:34 remaining to lift the Dragons to a 32-28 win over Garden Plain. Casey Kohr sealed the game with a late interception inside the five-yard line to end a final Garden Plain threat and preserve the win. The Dragons and Owls battled back-and-forth in a game that featured seven lead changes and no lead bigger than eight points. Halstead grabbed a 16-14 lead at halftime before Garden Plain went back in front 20-16 with a 75-yard touchdown pass from Alex Becker to Nate Pauly in the third quarter. Heimerman added a touchdown run later in the quarter to give the Dragons a 24-20 lead. But Garden Plain would answer back before the end of the third quarter with another Becker touchdown pass. Trailing 28-24, Halstead mounted a drive deep into Garden Plain territory mid-way through the fourth quarter, but the Dragons were stopped on downs at the Owl 6-yard line. Halstead would get the ball back and drive 36-yards resulting in Heimerman’s winning touchdown. He finished with 129 rushing yards and two touchdowns. Halstead quarterback Eli McKee rushed for 164 yards and a pair of touchdowns for the Dragons who played without all-state running back Blake Beckett due to injury. Beckett entered the game with more than 1,100 rushing yards on the season. Garden Plain quarterback Alex Becker returned after sitting out last week with an injury to pass for 229 yards and four touchdowns. Nate Pauly caught six passes for 196 yards and three touchdowns. Brady Rugan scored three first-half touchdowns as No. 2 Central Plains handled No. 3 Solomon 46-14 in District 5. Rugan rushed for a pair of scores and caught a 10-yard touchdown pass from Braedan Crites as the Oilers grabbed a 24-6 lead in the second quarter. The nail to the Gorillas’ coffin may have come on the final play of the first half. With just seconds remaining, Crites avoided a rush, scrambled around and launched a 25-yard touchdown pass to Jacob Warnken. The Oilers took a 32-6 lead into the break. Solomon mounted a good drive to begin the third quarter, but quarterback Jake Tiernan was intercepted by Central Plains’ Hunter Ingham inside the 10-yard line to stop the threat. Clark Besthorn capped the strong performance by the Oilers with a pair of second-half touchdown runs. Central Plains converted five of six two-point conversion attempts on the night. Jake Tiernan rushed for a score and tossed a 56-yard touchdown pass to Cyrus Haynes to account for Solomon’s scoring. Columbus, the top-ranked team in Class 4A-II, survived its second big test of the season in outlasting Frontenac 54-43 on Friday night. The Titans clinched the CNC League title with the win, but it didn’t end up being as easy as it appeared early on. Columbus jumped out to a 40-7 halftime lead behind senior running back Jace McDown’s 150-yard, three-touchdown first half. Frontenac began to chip away in the third quarter as Brandon Mlekus threw a touchdown pass to Ryan Menghini and added a rushing touchdown to pull the Raiders within 40-21. The fourth quarter scoring began with a 26-yard run by Cadin Bolinger to pull Frontenac to within 40-29. The teams would then trade touchdowns as Javohn Morrill broke along run for Columbus and Mlekus tossed a touchdown pass to Riley Swigart for the Raiders. Columbus led 47-37 with 7:33 remaining. Columbus put the game away with a touchdown shortly after to extend their lead to 54-37. Bolinger scored in the final minute for Frontenac to bring the final margin to 54-43. McDown led Columbus with 270 yards rushing and four touchdowns. For the second consecutive week, Mill Valley rode the momentum of a late second-quarter touchdown into a dominant second half. Right after Bonner Springs pulled to within 20-14 on Marcel Holmes touchdown reception from Conner Byers; Mill Valley’s Logan Koch completed a Hail Mary touchdown pass to Christian Jegen for a 26-14 halftime lead. The Jaguars then controlled the second half and pulled away for a 48-14 win over the previously unbeaten Braves. Koch scored on a short touchdown run to push the lead to 34-14 after three quarters, and Jegen added a pair of rushing touchdown in the final period for the 34-point win. Bonner Springs (7-1) will take on St. James Academy (7-1) next week with the winner advancing to the 5A playoffs. Alex Bott scored four touchdowns and Wichita Northwest rushed for more than 400 yards in a 38-21 victory over Garden City. Bott answered Garden City touchdowns with a pair of rushing scores to pull the Grizzlies even with the Buffs at halftime, 14-14. After halftime the Grizzlies took their first lead on a 36-yard touchdown by Jahlyl Rounds, and added a Jeremy Deckinger field goal for a 24-14 lead. Garden City would strike right back on Jesse Nunez’s second touchdown pass of the game – this one to Patrick Clifford. But Bott would add his third rushing touchdown of the game, and then get into more familiar territory in catching a 25-yard touchdown pass from Kevin Folsom to put the Grizzlies up 38-21. Bott finished with 117 rushing yards and three scores on only nine carries. He also caught five passes for 82 yards and a score. Rounds led Wichita Northwest with 155 yards on the ground on 19 carries. Antonio Joyner added 138 yards rushing on 27 attempts. The Grizzley defense limited Garden City to 115 rushing yards on 30 attempts. The Buffs entered the game averaging 315 yards per game on the ground. Behind another strong first quarter, Spearville bested Hodgeman County 46-0 in the battle of unbeaten in Eight-Man, Division I. The Royal Lancers scored 24 points in the first quarter on a pair of touchdowns from quarterback Nathan Stein. Shortly after Stein’s second touchdown run, Spearville’s Brandon Davis scooped up a Longhorn fumble and returned it 21 yards for a touchdown and a 24-0 lead. The Lancers added a pair of touchdowns in the second quarter on a Luke Heskamp run and Nathan Stein’s pass to Kyler Stein. Spearville ended the game in the third quarter on a Heskamp 50-yard sprint to the end zone. Bishop Miege is considered by many to be the favorite to win a second consecutive Class 4A-I state championship later this season. But on Friday night, the Stags got a tough test from a good Louisburg Wildcat team. Louisburg trailed Miege 7-6 late in the second quarter before the Stags scored with five seconds remaining in the half to lead 14-6. Miege flexed its muscle after the break by outscoring the Wildcats 28-0 on their way to a 42-6 victory. Senior running back Dawson Downing rushed for 128 yards and three touchdowns to lead the Stags. Sophomore quarterback Carter Putz passed for 287 yards and two touchdowns, and Landry Weber added a long touchdown pass to Jafar Armstrong off of a reverse. Armstrong caught eight balls for 203 yards and two touchdowns. Downing and Nolan Gray each added 50 receiving yards, and Cameron Clark caught a 14-yard touchdown pass.